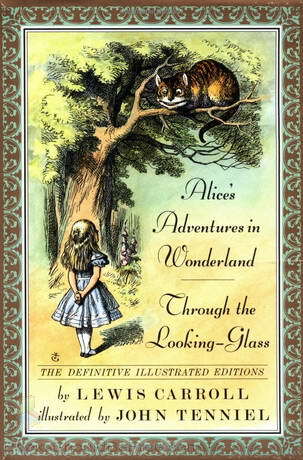 Once upon a time long, long ago at Catholic University — I become a devoted devotee of Lewis Carroll. Never having read Alice in Wonderland or Through the Looking Glass as a child, I became a huge fan when I enrolled in a course called “The Literature of Fantasy”. We read The Hobbit and the Lord of the Rings by JRR Tolkein. We read The Lion, the Witch and the Wardrobe, The Narnia books, and the Out of the Silent Planet series by CS Lewis. And I loved each of these authors and each of their books. But by far my favorite writer in this genre was the shy Anglican deacon and mathematician, Charles Dodgson — pen-named Lewis Carroll. Post college, I became something of a fanatic. Lewis Carroll has pride of place in my library and “Alice” has her very own shelf on my bookcases. I have reproduction copies of the first editions. I have the Annotated Alice as well as The Arthur Rackham Illustrated Alice. I even have a copy of the original story Lewis Carroll first wrote down for little Alice Liddell – Alice’s Adventures Underground. And over the years I have collected little “Alice things” along the way. Christmas tree ornaments, postcards, and china figurines. And just a few months ago, when my youngest was launched for the second time (I have launched all three of my children twice. Two times seems to be the magic number! ), I have finally turned “the kids’ room” into a real guest room. And it is now my little Alice in Wonderland room. But not of the Disney variety. The Disney variety is saccharine and sweet and an abomination. The Alice books are of course delightful but they are also dark and disturbing and disorienting. The titles themselves – “Alice in Wonderland” and “Through the Looking Glass” are both deep and delicious metaphors for one’s bipolar moods. The prints on the walls of my little Alice room are John Tenniel’s pen and ink, Arthur Rackham’s Victorian earth tones, and Salvador Dali’s wild watercolors. No, no Disney cartoons here. Discussion Question: Just how long and deep was the last hole you fell into? Did your feet touch bottom? Or are you falling still? The Pool of Tears “’Curiouser and Curiouser!” cried Alice; “Now I’m opening out like the largest telescope that ever was! '” Alice’s head struck against the roof of the hall: in fact she was now rather more than nine feet high. Poor Alice! She sat down and began to cry. “You ought to be ashamed of yourself, a great girl like you to go on crying in this way. Stop this moment I tell you!” But she went on all the same shedding gallons of tears, until there was a large pool around her, about four inches deep and reaching half way down the hall. Discussion Question: When have you felt so stretched to your limit that all you could do was sit down and cry? A Caucus Race So out of the Pool of Tears, the Dodo says, in an offended tone, that the best thing to get us dry is a Caucus-race. “And what is a Caucus-race?” said Alice?”; not so much that she really wanted to know. ”Why,” said the Dodo, “the best way to explain it is to do it.” First it marked out the race-course in a sort of circle (“the exact shape doesn’t matter” it said) and then all the party were placed along here and there. There was no “one, two, three and away”, but they began running when they liked and left off when they liked, so that it was not easy to know when the race was over. Discussion Question: What rat race have you been running in? What did you win and what did you lose? Discussion Question: Who were you when you got up this morning? Who were you when you went to bed? Try to explain the difference. Discussion Question: Look to the person on your left. Look to the person on your right. Look at the person in front of you in line at the grocery store or behind you at the bank. Take a look at your neighbor across the street. Take a good look at your coworkers. Discuss how everybody and everyone is mad. Discussion Question: Share a crazy-making situation where you thought you might lose your head. How did you manage to keep it? Or did you lose your head after all? Discussion Question: Is it better to dance with the lobster you do know or the turtle you don’t? So friends, want to join this crazy book club? The coffee is brewing in the kitchen. Come exactly as you are. Come and join the dance. The Divine Fool leads. It ‘s up to us to follow. Note: It’s National Mental Health Awareness Week, October 5 – 11. This post is “synchro blogged” with the release of Sarah Griffith Lund’s book, “Blessed are the Crazy: Breaking the Silence Around Mental Illness, Family, and Church.” Check it out! Categories: Spirituality and Mental Health | Tags: #BlessedAreTheCrazy, Alice in Wonderland, bipolar disorder, Lewis Carroll, mental health, National Mental Health Awareness Week, spirituality, Through the Looking Glass | Permalink. Pingback: mental illness: 3 sets of 3 things | kathy escobar.